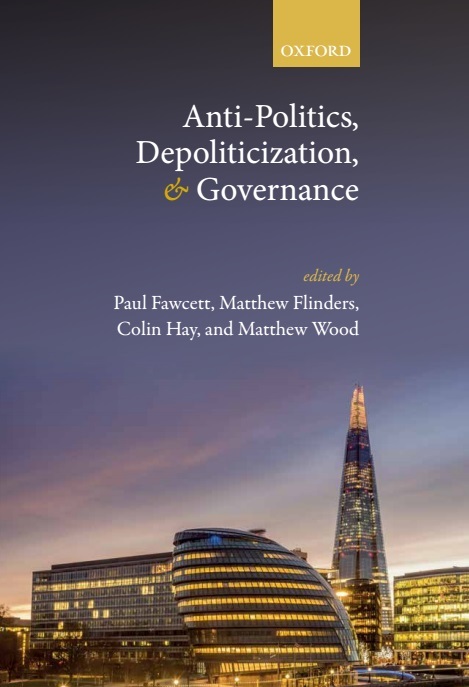 We are pleased to report that Anti-politics, Depoliticization and Governance – edited by SPERI director Colin Hay, with Paul Fawcett, Matthew Flinders and Matthew Wood will be published by Oxford University Press on 7 September 2017. The book examines the relationship between moves towards depoliticization and the apparent rise of political disaffection within broader governance process. It brings together a number of contributions from scholars who have a varied range of concerns but who nevertheless share a common interest in developing the concept of depoliticization through their engagement with a set of theoretical, conceptual, methodological, and empirical questions. SPERI’s deputy director Craig Berry and research fellow Scott Lavery also feature in the book, with their co-authored chapter ‘Towards a Political Economy of Depoliticization Strategies: Help to Buy, the Office for Budget Responsibility, and the UK Growth Model’. Berry and Lavery examine macroeconomic policy-making in post-crisis Britain in order to demonstrate the ways in which depoliticization strategies are embedded within distinctively capitalist forms of social organization. Click here for more information about the book and to purchase a copy.